Stuffed poblano peppers are a classic dish in Mexican cuisine, but this particular recipe – from the Mexican state of Guerrero – is somewhat unique because the peppers are prepared in a quick pickle and served cold, not baked or fried. Needless to say, using tuna salad as stuffing is also a twist from the more common ground meat and cheese recipes, and welcomed as a nice choice for the Lenten season. It is well worth waiting for the flavours in this dish to blend together in the fridge, even overnight; the tuna salad is a refreshing complement to the peppers, and the onions and garlic acquire a mild pickled taste which, in contact with the peppers, round up a light yet filling lunch, first course, or appetizer. I am also bringing my stuffed peppers to What’s for Dinner? 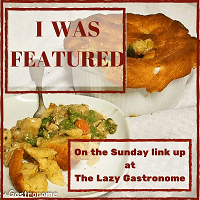 Sunday Link-Up #196, hosted graciously by Helen @ The Lazy Gastronome. Thank you for the nomination @fakeflamenco! I am currently in Mexico, but I will get to it as soon as I get back (April 11). Again, muchas gracias! What a delicious way to eat tuna! Thanks for joining the What’s for Dinner party! This looks delightful! I’ve actually never had a poblano pepper, but if I ever see one sold in Japan, I’m definitely making your recipe! Yum! !